Indian Mobile Subscriber base is now getting awfully close to 1 Billion users – and in all probability India should have it before the end of the year, or even couple of months earlier. India will be only the second country after China to achieve it, and will remain so as no other country has that kind of population! According to latest TRAI report for June 2015, India has reached a total telecom subscriber base of 1006.96, out of which 980.81 million are mobile subscribers and 26.15 million are wireline subscribers. June witnessed an addition of 5 million new mobile subscribers whereas fall of around 120,000 subscribers in case of wireline. In June the growth in Urban circle was more pronounced as compared to rural areas. This is opposite of what we have been seeing for past few months where rural subscriber additions were much higher. 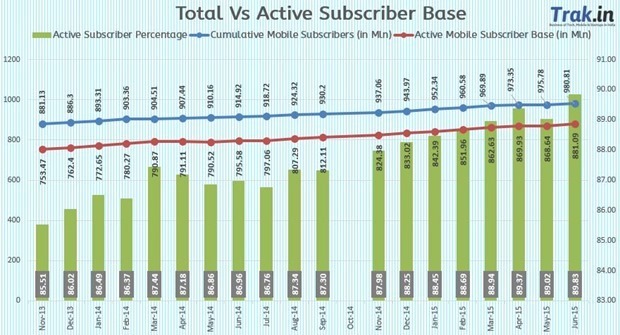 Here is how the mobile subscriber base has grown over past 18 months or so. In last 2 years, no a single month has seen negative growth – the last time we say a subscriber fall was back in September 2013. Even Active subscriber base saw steep rise. While last month we had seen a marginal fall, this month active subscriber numbers grew by over 12 million compared to previous month. In May 2015, India had 868.64 million active subscribers, which grew to 881 million or 89.93 percent of total subscribers. – With an increase of 5.02 mln in June 2015, total mobile subscriber base has reached to 980.81 million. 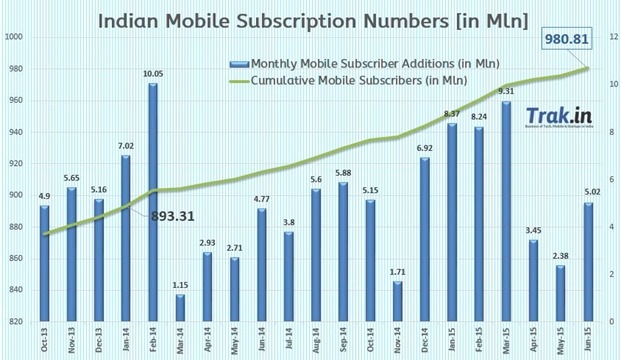 India had 975.78 million subscribers by end of May 2015. – Urban India witnessed a monthly subscription increase of 0.74 percent or 4.12 mln subscribers, while rural mobile subscriber base increased slightly by 0.22 percent or 0.90 mln. – Urban India has a total of 562.95 million, while rural India has a total of 417.85 million mobile subscribers. 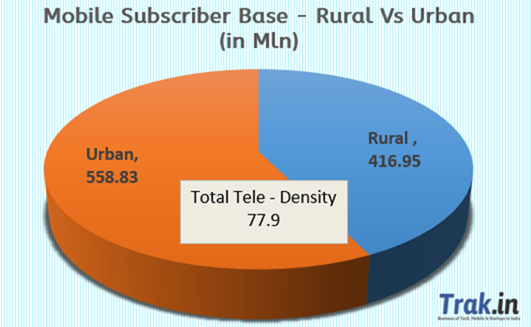 – Urban Teledensity increased to 144.25 from 143.42 in May 15, while the rural tele-density increased to 48.10 from previous 48.03 . – Urban mobile subscriber share stands at 57.40% as compared 42.60% of rural subscribers. – 3.68 million new Mobile portability requests were made in month of June 2015, taking the total tally of MNP requests since launch to 163.93 mln. – Active Mobile Subscriber base increased from 868.64 mln in May 2015 to 881.09 million in June 2015, taking the active percentage to 89.83 percent. Ideal Cellular is making a habit of this – they were the operator with largest number of mobile additions in June 2015. Infact, in 5 out of last 6 months, Idea has beaten market leader Bharti Airtel to add maximum number of subscribers. Bharti Airtel remains the leader in with 23.57 percent market shared followed by Vodafone (18.9%) and Idea Cellular (16.53%). On the other hand, BSNL has a made a habit of losing mobile subscribers to other operators. In last 12 months they have lost over 10 million subscribers from their kitty. They now have only 7.89 percent market share in India. Two years back, BSNL had over 10 percent market share. 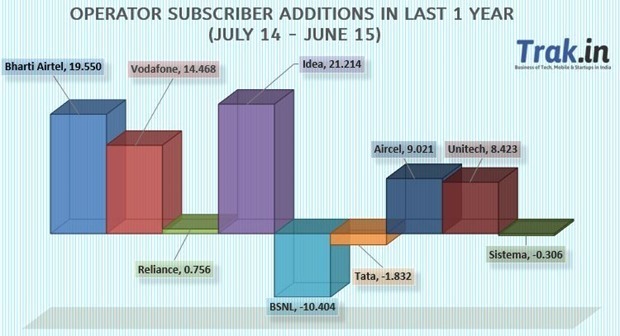 Here is the cumulative sum of subscriber additions by various Indian mobile operators in last 12 months. "India Mobile Subscriber Stats June 2015: 981M Total, 881M Active, 164M MNP Requests", 5 out of 5 based on 1 ratings. BSNL Chaukka-444 Offer Launched; 4GB Per Day at Rs 444 For 90 Days!